I always knew that one day I would have to write this post, but that doesn't make it any easier. Just over three weeks ago, dear Humphrey passed away. I haven't felt able to write about it until now, needing a bit of time to come to terms with it by myself. You know that thing where, when people are nice to you, you kind of fall apart? Well what with it being the build up to Christmas, and me working on my own, I had to try and keep it together, so couldn't risk a blog post opening the floodgates really. I don't have children. Humphrey meant the world to me. He worked with me in the office, sat with me on the sofa in the evenings and slept on the landing at night. Well, okay, sometimes on the bed. Over the nine years I had him we did lots together. We moved house three times, closed the shop, went on holiday together. And he has seen me through some really difficult stuff. He had been unwell for a few months. His teeth had started to grow a bit oddly - so common in bunnies - and sharp points were forming and causing painful mouth ulcers for him. It meant he couldn't eat properly. Thank God I have a wonderful, wonderful vet (and insurance) so we were able to keep him going for a while longer, with little dental operations. But the last one, well he just didn't recover properly. He was starting to suffer and I couldn't help him. He didn't want to eat, even his most favourite things, it was heart breaking. So, on the 7th November, I made the decision to say goodbye. He died it my arms at the vets at 5.30pm. He is now buried in the garden outside. I am going to plant some bulbs there for the spring. I have written the blog post I was dreading. I have so, so many happy memories from the last nine years, and too many photos I want to share, so I have put together a little film with some of my favourite pictures and clips. I've been working at it, on and off, for a couple of weeks, it has been a really nice thing to do and has helped me a bit. Cottontails is not the same without him, and of course there will be another bunny in time. Probably in the New Year. Definitely a rescue rabbit. It's just the way it goes with our little pets isn't it. Oh Charlotte, I'm so sorry. I could say lots of wonderful words, for there would be so many to write about your gorgeous little companion, member of Cottontails staff and best friend, but I'll just say 'RIP Humphrey....you were the best'. Whichever little rescue bunny is lucky enough to come to live with you will be watched over by your constant companion of the last nine years, only the best will sit next to him in your heart. Prayers and Hugs for you and Humphrey. I hope you start to feel better in time but I know it will be difficult for a long while. I know exactly how you feel and you have my full sympathy. Oh, I really liked him. Sweet bunny. Sharing your loss all the way from California, dear Charlotte. I'm crying at my desk too. He was so blessed to have you as a "fur mom." What a lovely song. Do you mind sharing the name and artist? It was perfect for this video. Bright mutton chopped Bunny, Humphrey will be missed world wide, hugs to his family who must somehow continue on without him. Thank you from the bottom of my heart to everyone who has left such lovely, lovely comments. It means so much to me. I'm sorry if I've had everyone in tears though (although I too have spent most of today falling apart..) Talking (writing) about him after three weeks of silence is so nice, but it does hurt. (Sniffles) He was such a handsome, loving, charmer! They're never with us long enough and the holes in our hearts are five times their size.. Our little long eared angels. Tears....I'm so sorry Charlotte. He was such a beautiful boy. Sending lots and lots of hugs for your heart. Oh Charlotte. I'm so very sorry. He couldn't have had a better life, he really couldn't. Sending the biggest hugs. Sleep well little man. I am so very sorry to read this news. Godspeed sweet Humphrey, I am a little late but I will light a candle for you. I'm so sorry that Humphrey's gone.... He was such a handsome gentle bunny. The slide show is lovely, a very sweet tribute to him. Oh Charlotte! 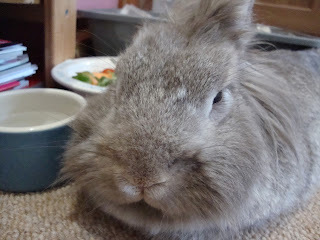 I'm in tears :( I lost my Millie a while ago & still havn't been able to blog about it. I rescued a new friend for George but very sadly she died a few weeks later. I really know what you are going through. There is nothing like a heart bunny. I'm glad Humphrey will live on in Juliet's story, as he will in your heart. I love the pics of you and Humphrey in the summer garden, and you in your red dress holding him! so beautiful, so loving! So sorry to hear the news about Humphrey. I logged on today to check how things are, as you had been quiet for a while. Such sad news, but at least you will cherish some beautiful memories. Oh dear, I know just how much it hurts to lose a beloved bunny friend.I am sorry for your loss. Humphrey looks like he was an absolutely amazing bun and I can understand why you miss him sorely. It sounds like he had a wonderful long and happy life with you and over time when the sadness ebbs, you will have many warm memories to make you smile. and I shall be visiting your geogeous shop before Easter..